You can find hyacinth flower in florist's shops in the middle of winter. It's more enjoyable, though, to force the bulbs yourself and watch them grow. And it's so easy to do. Bring on spring by forcing fragrant hyacinths indoors. 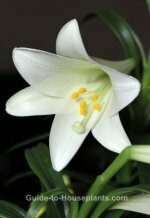 Each bulb produces a thick flower stem, which carries dozens of small, waxy flowers. The hyacinth flower is highly fragrant and comes in stunning shades of blue, violet-blue, red, orange, pink, yellow or white. Surrounding the flower stems are narrow, upright leaves. 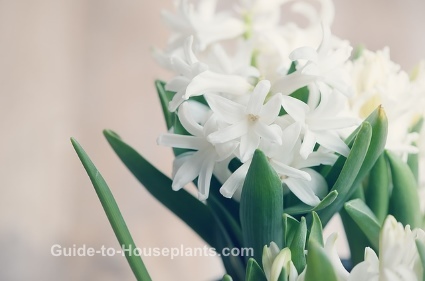 Naturally spring-flowering, hyacinth flower bulbs are easy to force into bloom mid-winter. The process is called forcing because the bulbs are tricked into behaving as if they've gone through a cold winter, then brought into warmth and sunshine as if it's spring. Hyacinth bulbs need a cold treatment for 12 weeks to bloom. If you bought pre-chilled bulbs, you can skip this step. You can begin the cold process anytime in fall. October is a good time to start for mid-winter blooms. If you have a lot of bulbs, you can plant just a few at a time, keeping the bulbs cold until you're ready to force them. This way, you'll have pots (or vases) in bloom throughout the winter and early spring. Choose a shallow pot (at least 3 in/7 cm deep) with drainage holes in the bottom. Fill the pot loosely with potting mix. Set bulbs side by side -- close but not touching -- pointed end up. Set bulbs so that their tips are even with pot rim. Do not press the bulbs into the mix. It should be loose so the roots can grow through it easily. Cover with additional potting mix, leaving the tips exposed. 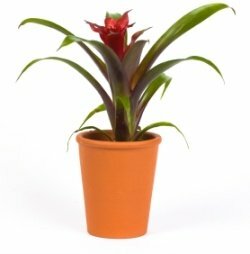 Move pot to a dark, cool, but not freezing, (40°F/4°C) location such as a basement, unheated garage or refrigerator. Avoid storing bulbs near ripening fruit or vegetables which give off ethylene gas that can damage the bulbs. Keep them in cold storage for about 12 weeks. Keep the medium barely moist. When shoots reach about 2 in (5 cm) tall, bring the pot out of cold storage and place it in a slightly warmer (50°F/10°C) location with low light intensity. Increase watering, keeping the soil evenly moist. Over the next few days, gradually move it toward a sunny window. Turn the pot every day for even growth. 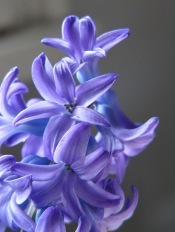 When in full bloom, keep hyacinth flower in a bright location out of direct sun to prolong the bloom. 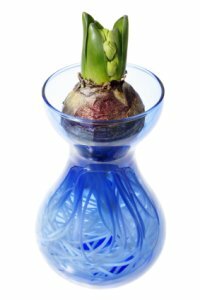 Want to grow hyacinth bulbs in vases instead? 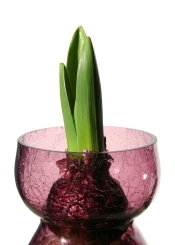 Hourglass-shaped hyacinth vases will hold the bulb in place while it's growing. Keep the bottom of the vase filled with water, but don't allow the bulb to sit in water because it will rot. Remember, it still needs chilling as described above. Keep the bulbs in a paper sack during the cold treatment. When you see them sprouting, bring the bulbs out and place them in the vases. Set vases in a bright, yet cool location. You'll find hyacinth bulbs for sale in fall. Different varieties have different bloom times, so it's a good idea to plant the same variety in each pot, rather than to mix them. 'Woodstock' hyacinth hybrids are ideal for forcing indoors. Other popular cultivars include 'Delft Blue', soft-orange 'Gypsy Queen', snowy white 'Carnegie', buttery yellow 'City of Haarlem' and 'Pink Pearl'. Height: 8-12 in (20-30 cm). Hyacinth flower heads can get heavy and may need staking. Temperature: Cool 45-65°F/7-18°C . Make your flowers last longer by keeping them in a slightly cooler location. Blooms will last for 2-3 weeks if kept at a maximum of 65°F/18°C. 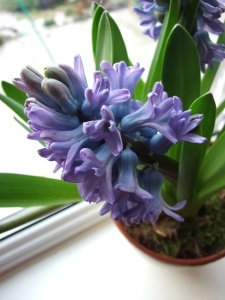 Propagation: Hyacinth bulbs that are forced into bloom indoors will not bloom a second time. They do produce offsets, which can be planted outdoors. If you want to keep them, allow the foliage to dieback naturally, then cut it back. Store the offset bulbs in a cool, dry place. Plant the bulbs in your flower garden in the fall.